Needles and Hooks and Books, Oh My! : Unfinished Friday! This week has been really busy with school, writing term plans and concept maps and reading textbooks, so I really have not had a lot of time to work on my crocheting. Everything I've been working on over the past few days is still in the middle of being finished. However, I have made some good progress on my Apple Blossom Stole, as I have finally gotten into the swing of the pattern. If I was going to make this pattern again, however, I would change all the treble crochets to double, and all of the doubles to single. I know that would make the overall effect less noticeable, but the trebles are still a bit unnatural to me. 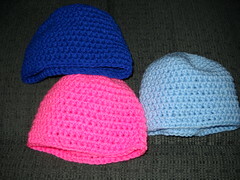 I have also been working on a few things for my 'shop'- more baby hats. These also go on the list of not finished, because I've only gotten as far as finishing the hats- the embellishments are not yet finished. And if I do say so myself, the hats are 10 times cuter with embellishments. (By embellishments, I mean either a flower, or ears, or a dinosaur spine...) Getting the hats done is the first step, though, so I'm closer to completing them than I was last week. 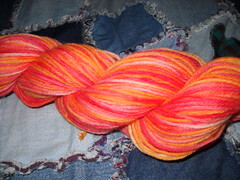 I've been dyeing yarn this week as well, which has been loads of fun. First I was testing out some 'unknown' food coloring that my mom's had around for a while. (I asked for some, and she was just like, here, take it). It's all been successful so far, and I'm quickly running out of stuff to dye. I'm branching into solids now, and I'm totally loving it! That's all for now! Head on over to Tami's Amis if you would like to see some *finished* stuff! That stole is a pretty color and texture. Great job and the hats and the dyeing too! 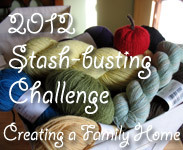 I love the little hats---I've got a similar one that I'm itching to make soon---and your stole is looking beautiful. 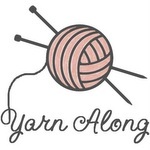 But oh my gosh, that yarn. The colours are so vibrant and delicious. Unknown food colouring for the win! 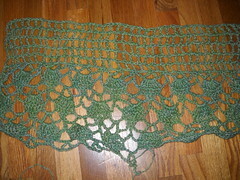 The apple blossom stole is looking really good. Looking forward to seeing it finished, very pretty colour.